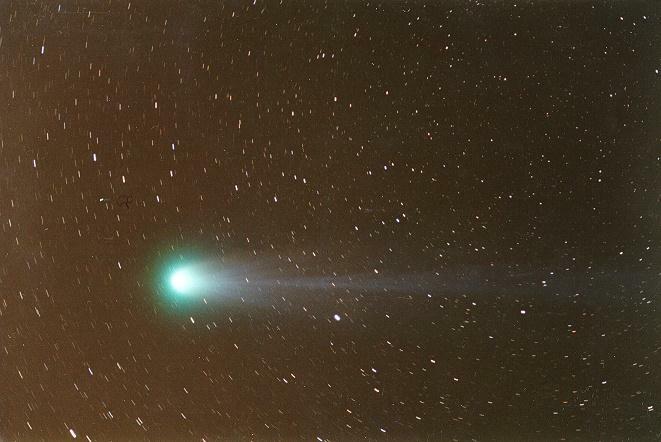 A nice image of the comet taken on March 23. Its a 5 minute exposure on Fuji 400 taken using a Nikon FG with a 135mm f/3.5 lens piggy-backed on a Meade LX-200 10" scope tracking in alt-az mode. I guided on the comet head using the main scope. The shot was take in Santa Cruz, California at 22:45 local time.